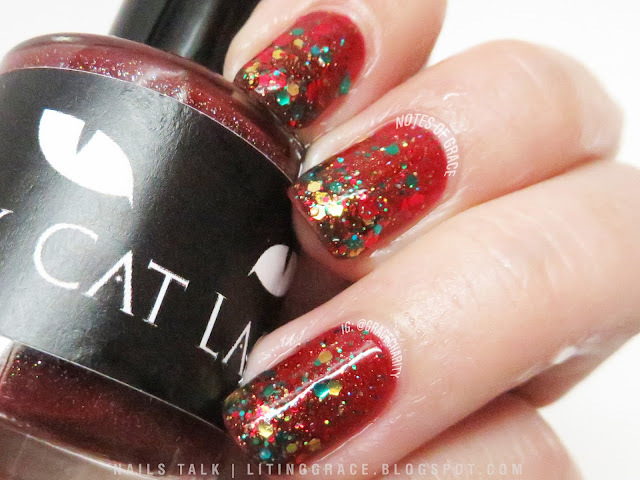 I've just realized that the last Nails Talk post was two weeks ago! Gosh, I really ought to be more diligent and blog more. It's no secret that I love thermal polishes with a capital L and have always been on the lookout for great thermal polishes. Some of my favorite indie brands for thermal polishes include Pretty & Polished and Polish by KPT. 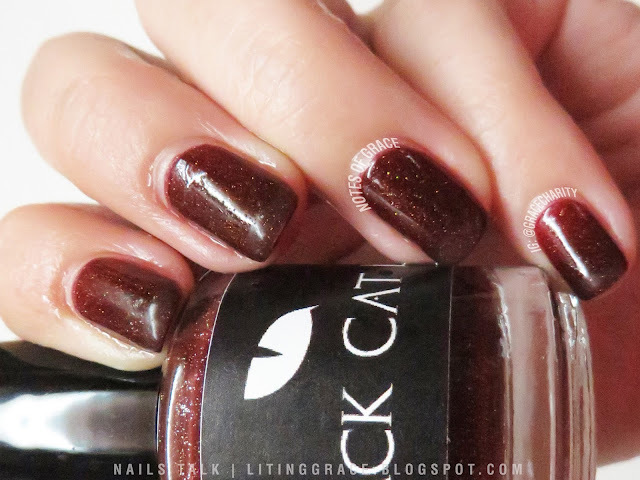 Recently I found yet another indie polish brand that has rise to the top of my favorite thermal polish. 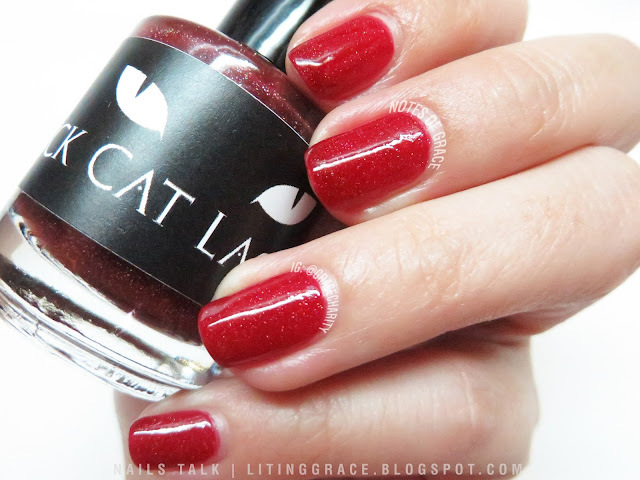 Red has always been my default favorite color when it comes to polishes and I have been searching for a red thermal polish. 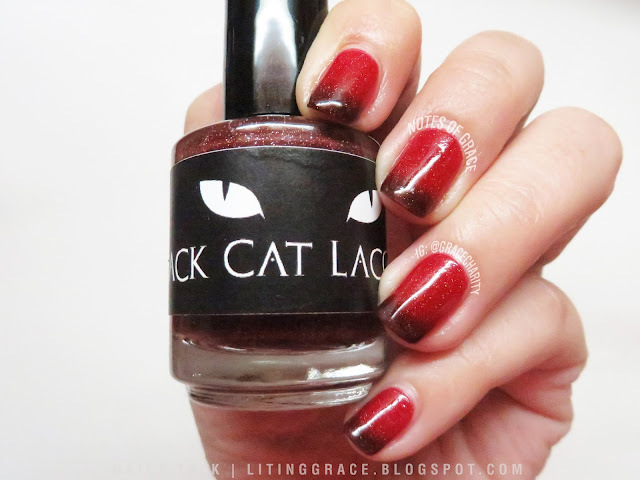 When I came across Poison Apple by Black Cat Lacquer, I just knew I had to get it. 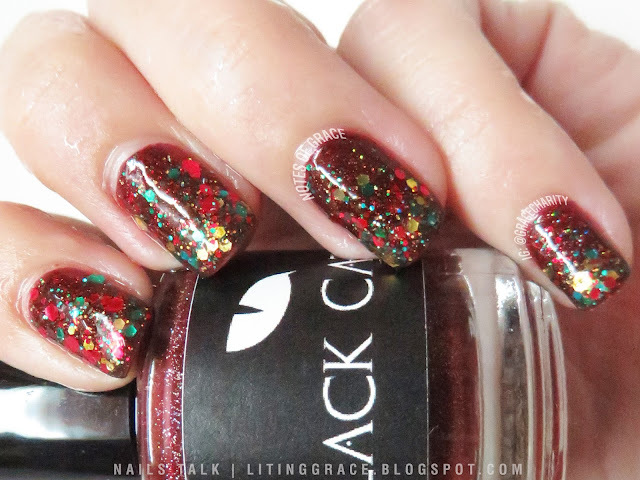 A jelly thermal polish, Poison Apple turns bright red with scattered holographic shimmer and a dark vampy red when cold. The above photos were taken after I had dunked my fingers into a bowl of ice water. You can see that the holographic shimmers were still visible. The photo above was taken when it's in the warm mode. And this was during transition. Now that my nails are longer, this is how it's like most of the time. How gorgeous is that?!? Both my favorite shades of red at the same time! This is no doubt my favorite shade of this polish! Formula wise, it was amazing! Smooth application, reaching opacity with just 2 coats and dries to a glossy finish. 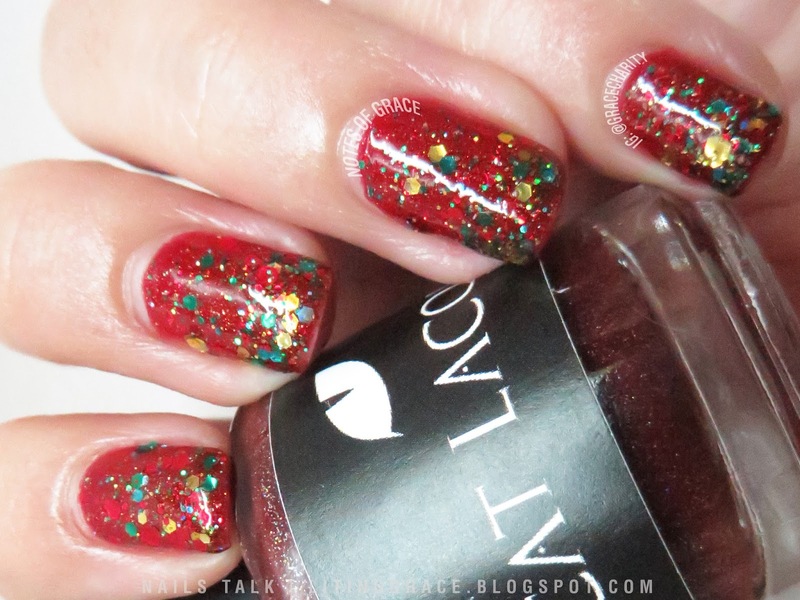 I was so in love with this polish that I wanted to wear it for as long as I could so I added some glitters to it. With Christmas round the corner, I chose KBShimmer Wrappers Delight. 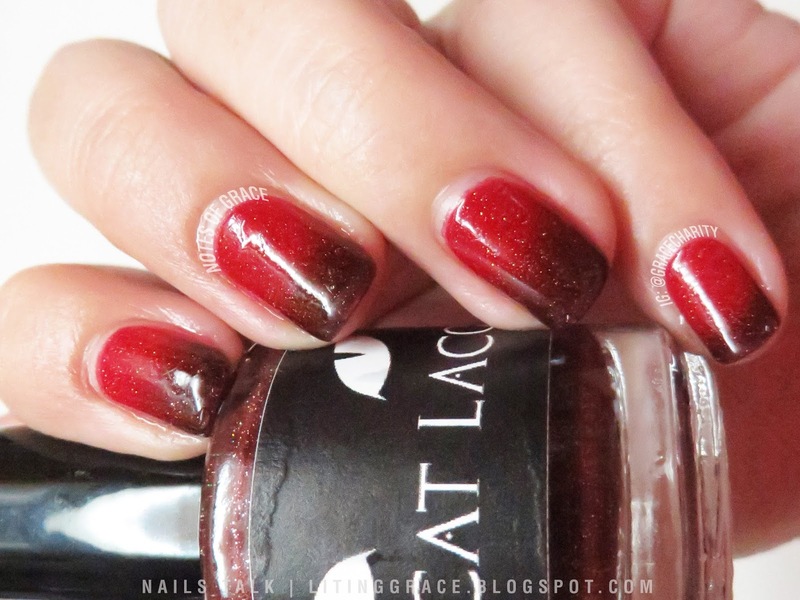 Though this is a Halloween polish, it's suitable for all seasons and daily wear. It's been a while since I last wore a particular polish for more than a week but this, I wore it for two weeks. 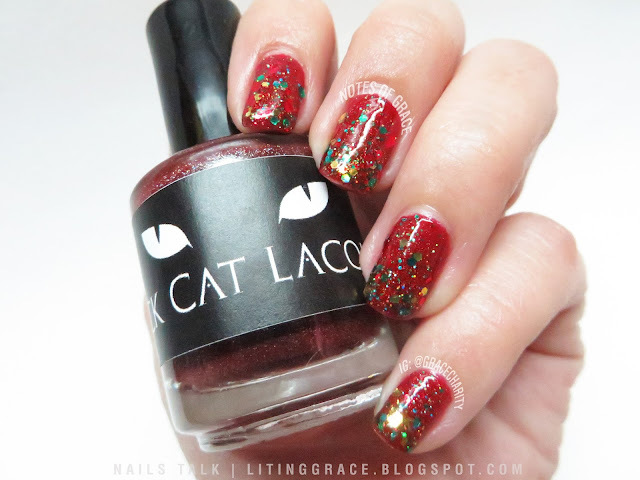 I can see myself wearing this polish so often, especially with Christmas and Chinese New Year happening soon that I'm already planning to get a back-up. So what do you think of Poison Apple? Which is your favorite shade and do you think it looks better on its own or with the glitter? Black Cat Lacquer is available on her website and also at Mei Mei's Signatures. Don't forget to check out the following links for updates and information on new colors.